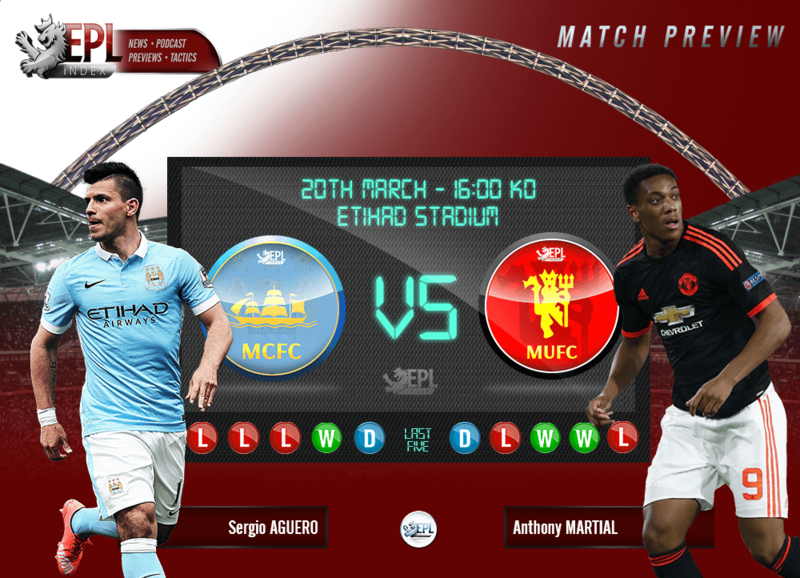 Manchester City are all set to face-off Manchester United at the Etihad stadium this Sunday. Two teams known to be stellar individually and intense rivals, meet yet again, but have their performances lived upto expectations this season? In all honesty, these are two teams that have been underwhelming-ly ordinary in the Premier League this season – it is nearly 25 years since a Manchester derby was played between two teams both outside the top three. The 170th derby in October proved to be a massive fail, and there is no doubt that fans of both sides would be expecting a lot from this upcoming clash. City are slated to face PSG in the Quarter Final of the Champions League, but they have fallen off the pace in the Premier League title race and could even be facing a battle to cling onto a top-four place. They trail leaders Leicester by 12 points and are also below Tottenham and Arsenal in the race for second and third. They could even be fifth by the time they kick off against United. Arch-rivals Manchester United are one of the sides who are also hoping to close the gap, and will have placed extra importance on the derby. United have themselves endured a difficult campaign, and suffered the indignity of a Europa League exit at the hands of Liverpool on Thursday. Ander Herrera is a doubt for United with the groin issue that forced him to sit out Thursday’s Europa League fixture. Ashley Young and Cameron Borthwick-Jackson could come back into contention having returned to training, while Adnan Januzaj and Timothy Fosu-Mensah are available having been ineligible against Liverpool. Wayne Rooney (knee), Luke Shaw (leg) and Will Keane (groin) remain absent, while Phil Jones is also out of contention. As well as the absence of Kompany, fellow central defender Nicolas Otamendi (dead leg) could also be doubtful this weekend. Midfielders Kevin De Bruyne (knee), Fabian Delph (Achilles) and Samir Nasri (thigh) are close to a return and could see some friendly action during the forthcoming international break. Manchester United have won just one of their last eight Premier League away games (W1 D3 L4). City have won four and lost just one of the last six Premier League meetings with United. Sergio Aguero has scored seven goals in seven top flight games against Manchester United. Only five players have scored more against the Red Devils in Premier League history (Ferdinand, Henry, Gerrard & Fowler with eight and Shearer with 10). Aguero has scored 11 goals in his last eight Premier League appearances at the Etihad Stadium. Manuel Pellegrini could become the first Manchester City manager to win four Premier League Manchester derbies this weekend. Unlike other prolific United strikers like Ronaldo, Martial has not come into a team with the same kind of consistency and stability, and the 20-year old needs to be praised a lot more for his commendable work. Martial’s quality was not enough on Thursday evening as United slipped out of the UEFA Europa League, despite the striker winning a penalty that he converted himself to put United 1-0 up. Sergio Aguero needs one goal to equal the most goals scored by a player in Premier League Manchester derbies and go level with Wayne Rooney (8). If he scores in this game then Aguero would have managed that in eight games, while Rooney took 16 derbies to do that. No doubt, he would be looking forward to scoring that in this crucial derby. With Aguero and Silva back in harness, and Yaya in rampant form against Dynamo Kiev on Tuesday night, it is the Blues who look to be in better shape. Much has already been made of the loss of Kompany, but City have no-one who truly strikes terror into Blue hearts, while Aguero is a serial killer when it comes to derby matches. With City wanting to close in on the gap in the EPL table, they are most likely to win this game. They also look like they’re in better shape. The match will probably end in a 2-1 victory for City over United. Categories: EPL Index Featured Article, EPL Index Match Previews, Manchester City, Manchester City (NN), Manchester United, and Manchester Utd (NN).' 'Tags: "Manchester United", Adnan Januzaj, Aguero, Anthony Martial, AVFC Vs MCFC Match Preview, Champions League, Fabian Delph, Kevin de Bruyne, Kompany, Manchester City, Martial, MCFC, MUFC, PSG, Rooney, Samir Nasri, Sergio Aguero, Tottenham, Vincent Kompany, and Wayne Rooney. When A King Loses His Crown: What has Happened To Manchester City?